I love when people feel at home in my home. I really do. “Grab a blanket if you’re cold. You know where the coffee mugs are. Come on in without knocking. Feel free to go in the fridge. Such delight it brings when friends know what they are to me- family, beloved! I hope my home is lovely, and I hope folks feel loved there. But I know of a far more precious dwelling place. Now, there are some things you must know. In the Old Testament, God chose to dwell in a tent made by hands, first the Tabernacle, and later the Temple in Jerusalem. Israel could meet with Him there. The journey to God’s dwelling place was a long, arduous, and often treacherous pilgrimage. Common Israelites were permitted to enter only the outer court of the Tabernacle. Even more restrictive was the Holy of Holies, the very seat of God. Solely the high priest, ONE man, ONE time a year could enter it. Now, keep all that in mind for a minute. 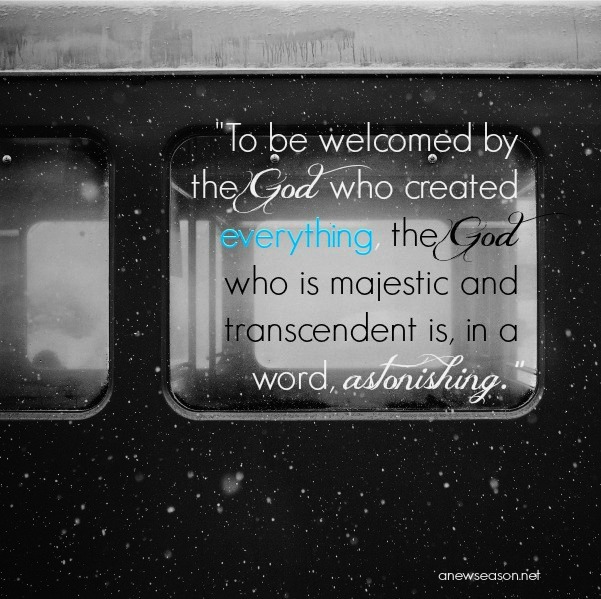 To be welcome in the house of the Lord, the God who created everything, the God who is majestic and transcendent is in a word, astonishing. So, the psalmists long for God’s dwelling place, yearning for it with a sense of urgency. They understand that meeting with God offers true delight, true satisfaction, and true fulfillment. Therefore, to dwell with God is their chief desire. Wow. I want God to be my chief desire, the captor of my affections. I want to sing and shout for joy, knowing He far surpasses all my hopes and dreams. I know He is the fulness. But I’ll be honest, I don’t always want God the most. Sometimes, other things vie for my attention. The hazards of the journey ensnare me. Sometimes, weeds and thorns threaten to choke out the truth, and other pastures seem greener. But there are things I must recall. God no longer dwells in a tent made by hands, but in hearts made of flesh. Through the completed work of Christ, God dwells within His church. He ALWAYS dwells with me. I get to meet with the living God. Daily. Hourly. Minute by minute. In a word, that’s astonishing. How then can I not delight to gaze upon Him, singing and shouting for joy? How then can I not recall what am to Him? Next > So she started to walk.